The mission statement that Kurt Linn, Paul Marino and Phil Reesnes adopted in 1989 when they collectively became RIVER, continues to apply to their lives some 14 years later. "We serve as ambassadors of Jesus Christ to inspire, encourage, and challenge people to live their lives in Him and in loving relationships with one another through Him." That mission is highly evident in the group's new project, You Remind Me. Considerably more acoustic than their previous efforts, but persuasively pop, You Remind Me is also more of what the group describes as "vertical" in its lyrical content. "This new CD is vertical in nature," says Kurt. "It is upbeat and worshipful, but this is not what we would consider a typical praise and worship project." Paul Marino, who wrote or co-wrote 9 of the 11 songs and served as producer for the recording, believes the project serves a specific purpose. "The songs on You Remind Me recognize Jesus for who He is and our place in Him," says Paul. "It is an attempt on our part to see ourselves as broken, yet willing vessels for the Lord to move in our lives where He chooses." The title song is a simple declaration of the importance of the cross to the Christian faith. "Sometimes we forget the simple fact of how good it is to be living as a child of God," says Paul. "The cross reminds us all of the promise of His devotion and should compel us to hold on to that promise regardless of our circumstances." 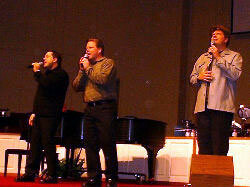 Another stand-out is "I Will Go," easily an anthem for any missionary cause. "The overwhelming thought came to me during devotions one morning that God has given me His approval," says Paul. "My efforts are in vain without Him leading me and directing me. I can only share what He has already done in me. That approval frees me to let His grace and love work through me. What an awesome thought." Though the predominance of the songs on You Remind Me are original tunes, River also chose to remake two praise and worship favorites, "Glorify Thy Name" and "Your Love O Lord." River also did a new arrangement for the classic, "Doxology," including adding a new lyric. River has released eight recordings including last year's, Road To Redemption. The title cut from that project garnered a lot of attention since it served as the theme song for the Billy Graham Association's World Wide Pictures movie also entitled Road To Redemption. Since 1997, River has been one of the most played artists on Christian radio with ten singles climbing into the Top 10 on The CCM Update's national Inspirational charts. River's concert ministry has impacted thousands with the group performing over 900 concerts and events over the course of their career. You Remind Me promises to continue River's success with Inspirational radio, and may even open new doors to this talented trio. "In every concert we do, we set aside a time just to sit at the piano and worship God," says Paul. "This CD comes closer than any project we've done to capturing that simple, unencumbered sound and that spirit of praise and humbleness before God." "I think this is the strongest vocal project we've ever recorded," says Phil Reesnes. "I am particularly drawn to the songs 'All I Ask,' 'I Will Go,' and 'Glorious.' Those three songs spell out the entire journey of our Christian walk. We ask to be used by God, we respond by being willing to go, and we praise God for His faithfulness. And it's really as simple as that."